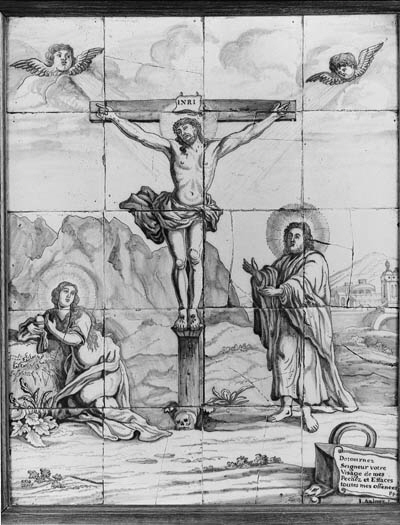 Medieval writers tried to establish historical links between the Fall and the Crucifixion, maintaining for example that the cross was made from the very wood of the Tree of Knowledge in the Garden of Eden and that Adam's burial place was at the site of the Crucifixion. The skull commonly seen at the foot of the cross alludes therefore not merely to Golgotha (the place of the skull), but represents Adam's own skull. The serpent with an apple in its mouth, near the skull, is a further allusion to the Fall. The inscription INRI at the top of the cross reads Iesus Nazarenus Rex Iudaeorum in full.